there aren't many things I like more than ..
“What's changing everything for me is a new understanding that we get to decide how we want to live. We get to shape our days and our weeks, and if we don't, they'll get shaped by the wide catch-all of “normal” and “typical,” and who wants that? I think about it when I'm taking the puppies for their night walks. My tendency is to always over-complicate food. Sometimes a recipe serves as a potent reminder to just let things taste of what they are .. with all of their extra freshness. I also know that when life gets busy .. I have a hard time finding minutes to cook. Believe me .. I understand. For this post .. I fashioned mine as a Mediterranean-style bowl because I had some homemade hummus, tomatoes, and cucumber on hand. But I also love these lentils on salads, scooped up with Mary’s Crackers .. or with some sautéed veggies and a topper of ripe avocado ..
Reduce the heat to medium or medium-low and simmer, uncovered, for 20-25 minutes, or until they're tender. In a large bowl, whisk together the oil, vinegar, lemon juice, mustard, maple syrup, salt, and pepper. Stir in the green onions, parsley, and tomatoes. Spoon them into the bowl with the other ingredients (it’s okay if they are still warm) and stir well. Serve immediately, or let cool slightly and then cover and marinate in the fridge for a couple of hours or overnight. This dish will keep in an airtight container in the fridge for up to 1 week, or you can freeze it in a freezer-safe zip-top bag with the air pressed out for up to 1 month. After thawing, adding extra dressing and sea salt will liven it up again. So first: This recipe sounds delicious. But I think thats a pretty obvious thing, as I am always looking for new vegetarian recipes. I actually have the book that you referenced. I have been meaning to read it, but life has been pretty busy, and its just got pushed back. From the sounds of it though, it is one that I definitely need to move up on my list. I also love walking on summer nights with my dogs. Especially in the early summer, here in Sweden it will stay light until 11pm, which means that while its nice and cool, it is not too dark out! (Although in winter its the exact opposite.) I am definitely putting this recipe on my list though, as I need to work on actually cooking healthy food again. Looking forward to hearing what your final takeaways from the book are! I have never tried lentils before, not quite sure why. I have to say that your recipe looks absolutely delicious, and I learned something new. I never would have thought lentils were for detoxing. Thank you! Oh golly, this sounds delish! Love the storyline & the mixture of spices with the food. Fun & timely post! I saw this and thought this is something I need to make and try but it just looks too complicated. When I scrolled down, I saw that, although there are quite a bit of ingredients, it doesn’t seem that complicated at all. I’m printing this out for dinner next week! I am an early bird so don’t understand how anyone could do their best work at night, I wold make so many errors if I even tried to write at night! Do you come up with these great recipes in your sleep? 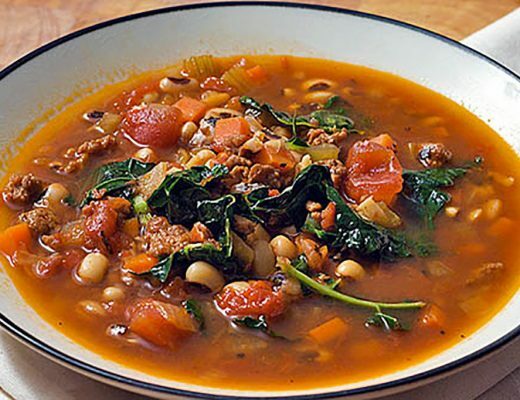 I am not great in the kitchen and prefer recipes that have ingredients commonly found in my pantry and fridge, for this recipe I just need to add lentils to my grocery list which means it is something I can make without too much effort and that’s what I need. Although what you have cooked looks healthy and delicious I am more interested in the book “Present Over Perfect” and the insights you have gained as a result of reading it. I am an introvert as well but have to operate as an extrovert because of my job which makes me busy and overbooked. I will look for the book on Amazon. It’s funny because I actually consider preparing lentils to be complicated because I have to plan in advance to soak them. I made a similar recipe to yours with an egg for added richness. But your yummy dressing with Dijon and maple syrup, very close to what I use as a salmon marinade, would blow mine lentil recipe away. I do like to write when everyone has gone to bed or in the early mornings when half the world and household are sleeping. I get my best ideas then. 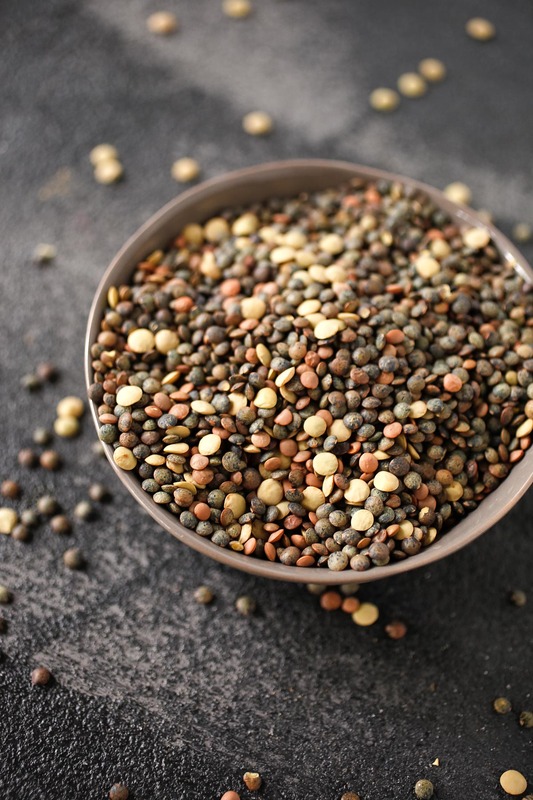 The recipe looks great nad so protein packed with all the lentils. I’ve been looking for detox foods – I’ve been feeling so sluggish lately and have been looking to change the way I eat. This is exactly what I’ve been looking for. I love Mediterranean food and would definitely eat it with hummus like you did. 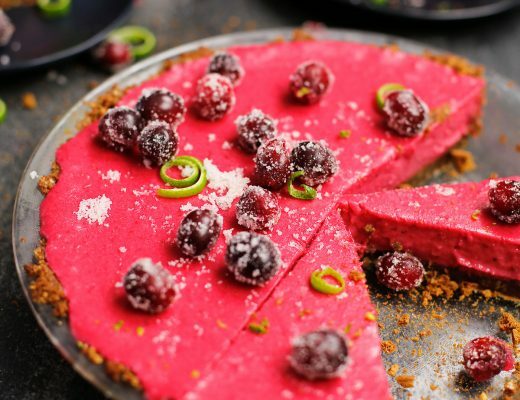 The best part is that I have the majority of the ingredients at home – win! I couldn’t agree more with alone-time. I myself am an introvert, though people hardly believe it because I can get a conversation going if I want to and come off more “outgoing” depending on my surroundings and the situation. These lentils look deeeelish! Excuse my poor spelling, but it’s the only way I think I can express how tasty this dish looks! Yum! We enjoy taking after dinner walks with the kids. It is nice when it finally cools off a bit. I just got a lot of Lentils and I honestly do not know how to cook them. So this recipe really comes at a great time. I am hoping to use the lentils I have to make something delicious. I enjoy writing when everyone is off sleeping too, but I really enjoy composing in the early morning. I prepare my coffee and sit back on the deck and just listen to the birds. It’s such a peaceful time for me. I have also been trying to find a way to live a more healthier life and your detox recipe appears to be one I need to try. Thanks for sharing this too! I, too, find myself most productive in the morning…I don’t do much reading or writing outside though and that’s something I’d really like to get into more…on the subject of getting into more, saying no is another constant struggle as well but it’s a steady progression toward getting better. I absolutely love Mediterranean dishes! This sounds especially delicious. I am a little unsure about the maple syrup. I don’t typically like it, but I’m guessing with all the other spices, the flavors really work well together! Haven’t had lentils in awhile. I’ll have to add this to my list of recipes to try! My husband would love it! Marinated lentils are a good alternative to rice. I don’t like overcomplicating food though. Making simple but delicious and healthy food is always what we do at home, especially on busy days. We have to take our pups on night walks as well. It is just too hot in Texas to go before 9:00 pm or their little paws will get burned hot from the hot concrete. I actually think they enjoy night time walks more as there are less dogs out walking. I have only used canned beans in salads, so I’m excited to use dry lentils. Your Mediterranean Salad is so colorful and the dressing sounds delicious with the maple syrup. . I always liked to think of mysel as an ambivert, but as I get older my introvert side shows a lot more. I used to always want to be in the company of others, usually spreading myself thin to do so. Now, I rather stay in by myself or with one or 2 close friends. Also, this recipe looks like a better version of A Chipotle burrito bowl! LOL Can’t wait to try it out! Lentils are something I’ve never really paid too much attention to, but I know that they’re something I should try to work in to my meals! This sounds delicious, and I love the fact that it has detoxifying properties, especially during the summer when I tend to indulge a little. 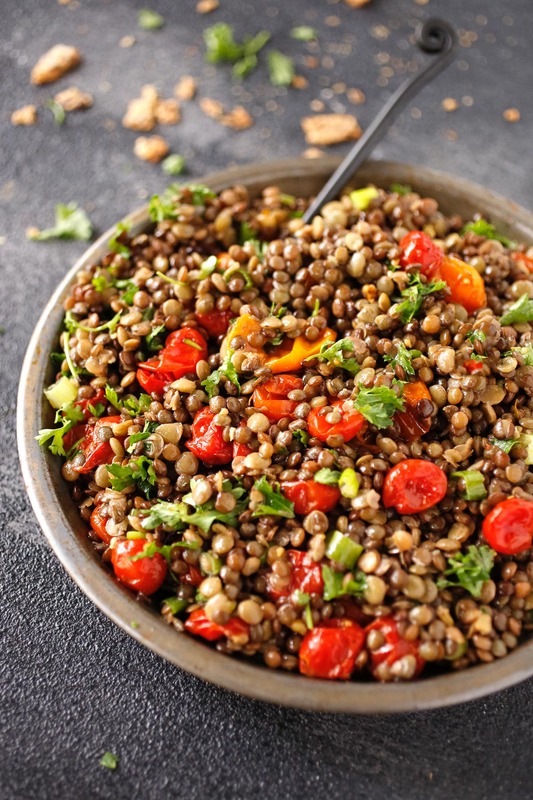 I have to admit that I was never a fan of lentils growing up and I’ve not eaten them since but they are a good alternative to the usual grains like rice or pasta and they’re versatile too, I love anything with Mediterranean flavours too so this looks so yummy, and healthy too! I like doing evening walks as well in summer but because at the moment I am feeling quite lonely, I don’t really go out much. I will have a friend’s dog for 2 weeks soon, so I will be forced to go out. I think it’s such a nice feeling to just walk, while your mind goes far, far away, and all of a sudden you find yourself back home and think when did the time flew by. I haven’t had lentils before, but this looks so good. I think my husband would even eat it. Of course mine won’t have eggs with it, but his would. Man do I miss eggs. I too am an introvert, which sounds strange as I’m a lifestyle blogger and obviously inviting people into my life. I do like and crave a lot of alone time but struggle as I’m a single mum to two under 5s so rarely get it. I’m learning to grasp my 3 miles drive between the school drop off and work as my quiet time for solitude. I am part of a Parisian group that starts the day at 5am. Mornings are all to me. Your bowl sounds pretty familiar to me, as a Mediterranean girl myself. That looks absolutely delicious. I actually don’t like beans, so that’s too much for me, but I try to eat more since it’s good for your health. Also as I recall lentils have a lot of health benefits too! My family LOVES lentils. We haven’t really experiement with a variety of recipes aside from the tradition way my mother in law taught me. But this looks delicious and so healthy and more filling. I actually suffer from Thalassemia and Lentils are one of my BFFs. This looks like a very simple and time efficient recipe. Your post reminds us that for the time constricted, there are options to make delicious and healthy foods. I love the photography as well. It makes it look really enticing. This looks amazing. I can’t wait to try it out. I absolutely love love love lentils. This one looks so healthy, nutritious and the best part..easy to make! Oh lentils taste great with everything, don’t they? Your photography is out of this world, I kept scrolling up and down not getting enough of your wonderful work! Night owls… UNITE! LOL. I am too. I love what your neighbour said about letting each day unfold. That can be one of the toughest undertakings to be able to do and feel comfortable with just allowing things to be. 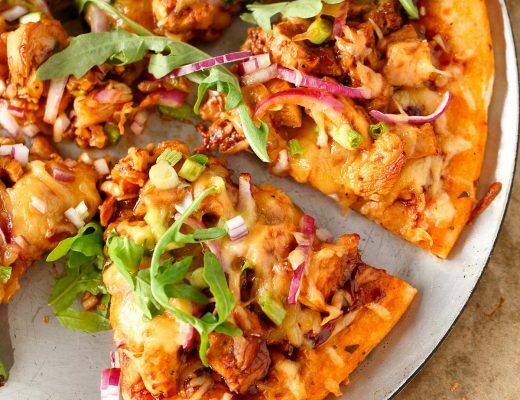 As to this recipe, holy moly, that looks incredibly delicious! I love this recipe. I am definitely guilty of struggling to eat a healthy lunch because I just don’t have time to prep something balanced. Prepping the lentils ahead and throwing a bowl like this together sounds perfect for an afternoon boost. I also have a problem with trying to do everything and meet every expectation. The book sounds so good I just went out today and bought a copy because it is something I definitely can benefit from reading. Thanks so much for that suggestion. Now I just need to slow down and find some time to read it. Working at home is never an easy task. You have to wake up early and sleep late. So def can’t do any walking. But this recipe, looks really delicious. With those ingredients, I guess my mom would be cooking instead of me. I love the note about respecting your own pace. That’s something I struggle with because I am so bad about comparing my success to someone else’s without even considering the fact that me and that person are on two different paths and timelines. Also, this meal looks really good. I honestly don’t think I’ve ever had lentils before. LOL! This is making my mouth water. I love lentils, I will have to make this for meal prep and try in different ways such as quesadillas. And it is healthy I do not feel guilty. Two things: I savored every line of Shauna’s newest book (I’m a fan of hers) and was soooo encouraged as well as convicted by her story. 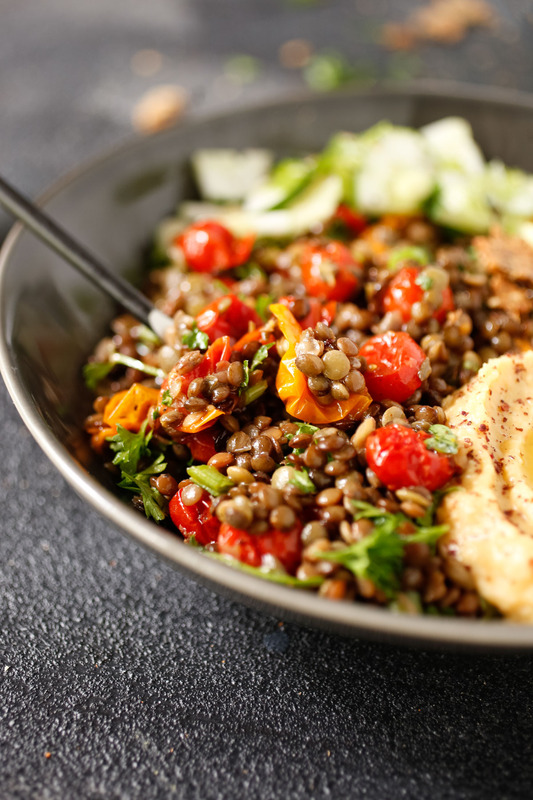 Secondly, your lentil bowl is simply amazing. I’m loving your photography as well as healthy dishes! You’re doing such a creatively good work here ? Looks good. Guess you could just as well stuff it all in some pita bread. Maybe add some minty-yoghurt sauce. Oh, I’m so going to do this. 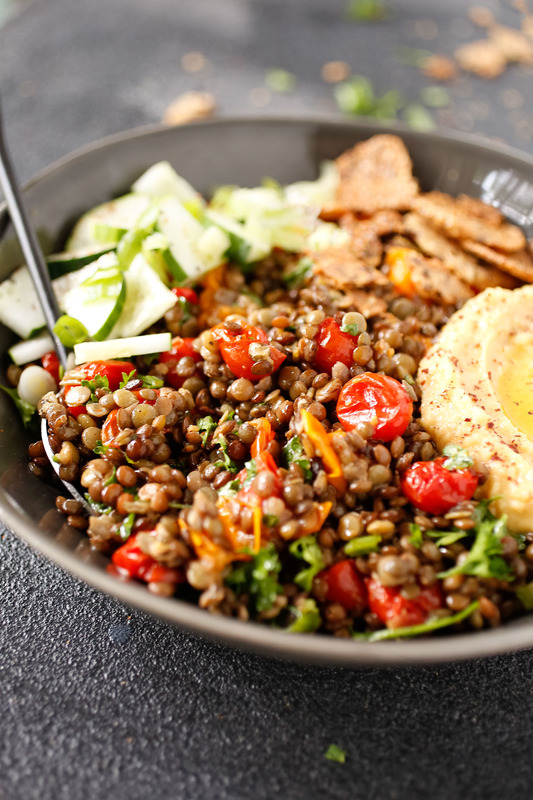 Oh my goodness, this lentil bowl looks absolutely amazing. I’ve been told that lentils are absolutely beneficial to our health and have such a huge source of protein in them. I’ve never tried them, but this dish makes them look absolutely delisioush! This looks amazing! I really would eat this for a weekend lunch at home with a glass of white wine. Love this recipe! I have a serving suggestion: Place a mound of the marinated lentils on top of a baked, halved acorn squash. Best served warm. 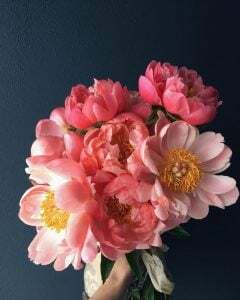 Beautiful presentation and delicious! First off, I love lentils in all their various shades; pink, brown, purple, black and white.. that salad looks inviting! Being a vegetarian lentils are included in my daily diet. 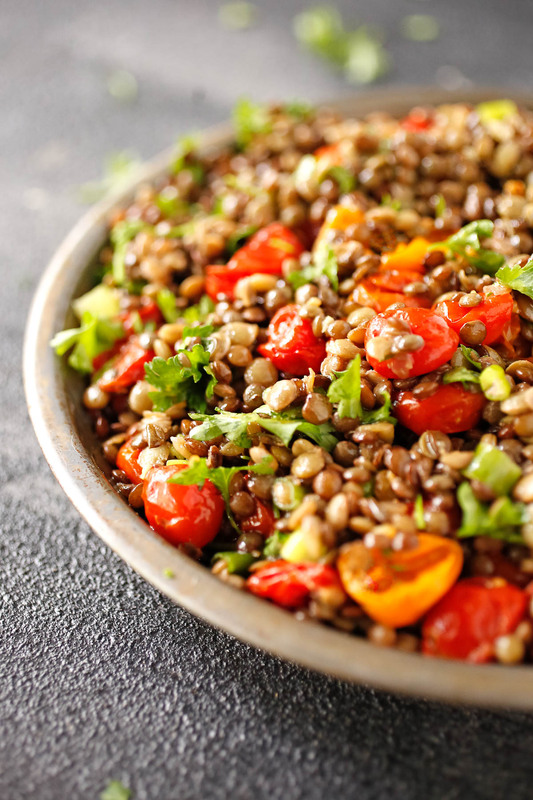 But I never tried lentil’s salad and this recipe really looks very innovative and new for me. 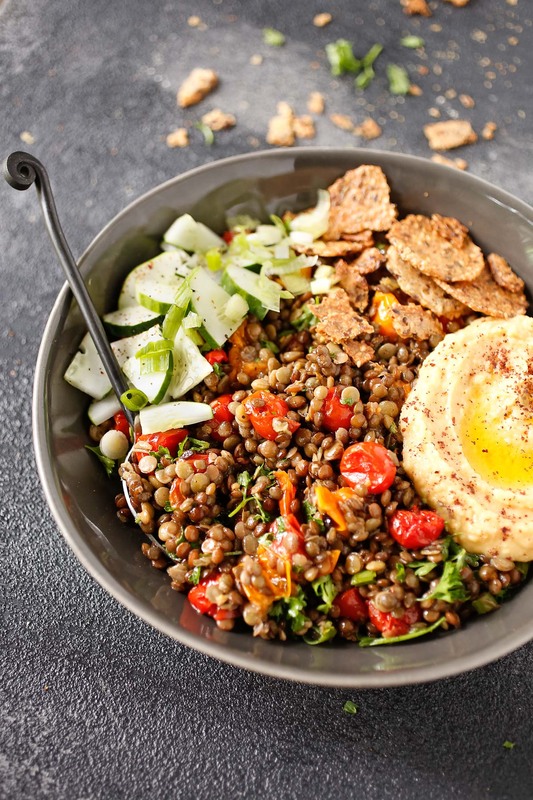 Mediterranean styled lentil bowl looks like my evening snack. What a great way to detox!